Why is EMI Shielding Needed for Your Cable Design? When designing a custom cable there are several factors that need to be taken into account. A major factor that is often disregarded is Electromagnetic Interference (EMI). Insulation protects a cable from mechanical abrasion, environmental moisture and spills. However, it offers no protection against electronic noise such as EMI; shielding is needed to guard the conductor against the effects of EMI. Cables can be a main source and receiver for EMI. As a source, the cable can either conduct electronic noise to other equipment or radiate the noise like an antenna. As a receiver, the cable can pick up EMI from other sources. In an unshielded cable, the wire is not protected by anything other than by an insulated plastic jacket. Capacitive sensing, which works by detecting changes in the electric field surrounding the central conductor inside the cable, can work through this plastic jacket. In a shielded cable, the outer shield creates a barrier that separates the electric field surrounding the central conductor from anything outside. If we create a barrier around the central conductor inside the cable, we have no electric field beyond that barrier, thus the shield. Michael Faraday, a 19th-century English scientist who contributed to the study of electromagnetism and electrochemistry, discovered the principles underlying electromagnetic induction, diamagnetism and electrolysis. The SI unit of capacitance is named in his honor: The Farad. Faraday's concept of lines of flux emanating from charged bodies and magnets provided a way to visualize electric and magnetic fields. In order to successfully block interference the shield needs to be highly conductive, shielding alloys with high-permeability are used. The shield then surrounds the inner signal or power-carrying conductors, reflecting the energy or picking up the electronic noise and conducting it to ground. Through shielding, some energy still passes through, but it is greatly attenuated that it does not cause interference. Foil shielding typically uses a thin layer of aluminum and mylar composite tape. Aluminum foil shields can provide up to 100% shielding coverage to the conductor, due to its continuous construction. It is constructed with one side of the foil shield being metallic and the opposite side non-conductive. The drain wire is in contact with the metallic side of the shield for proper grounding. Foil shielding is very weak in tensile strength usually stiffens the cable, making it less flexible. A braided copper shield is a woven mesh of bare or tinned copper wires. It does not provide 100% coverage due to the gaps in between the braids; it can provide up to 95% coverage. If the cable isn’t moving, the braided copper will provide a more powerful shield because it is more conductive than aluminum. However, the higher conductivity and the fabric texture causes cable thickness in the final design. Many different conductive materials other than bare copper (for example, tin-plated or silver-plated copper, or even composite metal-clad material) have been developed and improvements have been achieved in braided shielding applications. They tend to have lighter weight, more tensile strength, enhanced durability and more effective shielding performance; all of which are critically essential in aerospace and other mission-critical industries. For optimum protection in a noisy environment, multiple shielding layers with both the aluminum shield and the copper braid can be used together. For cables with multiple conductors, individual pairs are sometimes shielded with a foil shield to protect against crosstalk between the pairs, while the overall cable is shielded with foil, a braid, or both. How to Choose the Appropriate Cable Shield? The choice of proper shielding depends on several factors, including the environment in which the cable is used, cable budget (e.g. braiding is more costly than foil), degree of flexibility required, cable strength, etc. The most important step is to ground the drain wire of the shielded cable. The cable shielding and its termination must provide a low-impedance path to ground. 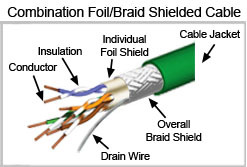 The drain wire and cable braid/foil are both part of a cable shield and are electrically connected. A shielded cable that is not properly grounded lowers the shielding effectiveness. Usually, rather than attempting to ground the entire shield, the drain wire is used to ease termination of the cable shield for crimping for soldering. When is EMI Shielding Needed? When a product has to meet agency standards like CE or FCC. Extra safety is desired for aerospace or military use, e.g. for electromagnetic pulses (EMP) controls. Sensitive instruments are to be protected from interfering or harmful frequencies. Download the free guide to uncover the prerequisites of designing a custom cable. Thank you for downloading our White Paper. Please check your email for the PDF download, don't forget to check your spam box. Thank you! One of our TeleTec representatives will contact you shortly. Thanks for signing up with us! We'll keep you connected with TeleTec news and updates!